If you like fancy looking bags with embroidered designs and beautiful looks, here is a step by step processes you need to achieve it! 40x50 cm of rich red wool fabrics for bags. 35x12 cm of rich red wool fabrics for handles. 35x12 cm of medium weight, sew in interfacing for handles. 34x40 cm of heavyweight, sew interfacing for facing. 40x50 cm of chocolate brown satin lining. Strong sewing thread in deep red. Sewing threads to match the rich red wool fabrics, chocolate brown velvet and lining fabrics. Over sized button in corn yellow. images of the above equipment. Draw a 2cm seam allowance all round each template and cut out to make the patterns. pin the main bag pattern on the red fabric and cut out for bag front. remove the pattern and cut out bag back. Using the same pattern, cut out two pieces from interlining and two from Lining fabrics. Use bag top pattern to cut four pieces from velvet fabric (two are for the facing) and two pieces from interfacing. With wrong sides facing,tack interfacing to two velvet strips. With the wrong sides together and matching the side edges, pin the bag front to a velvet top piece. the bag front will be wider than the top piece. So pin then together. on the back, pin the embroidered fabrics at the marks in step two and make small pleats. Make sure the back pleats are facing the centre of the bag and the bag front is lying flat against the top. pin the folds. then top edge allowance. with right sides together, sew the pleats in place as you do so. press seam on both pieces top stitch towards the velvet top, catching the seam allowance. With the right sides facing, pin the front and back pieces together sew the edges and base. Turn bag right side out. Mark the handle positions with pencil. pin the handles in the appropriate marked positions. sew the handles using a sewing machine. With right sides facing, join the bag lining and top facing together as for step 4 and 7 above. Referring to the template, mark then position of the magnetic clasp on the right side of one facing. Insert clasp. follow the manufacturing instruction. Slip lining inside the bag, with wrong sides facing the matching top edges. Top stitch in place along the top edge catching in bag handles. 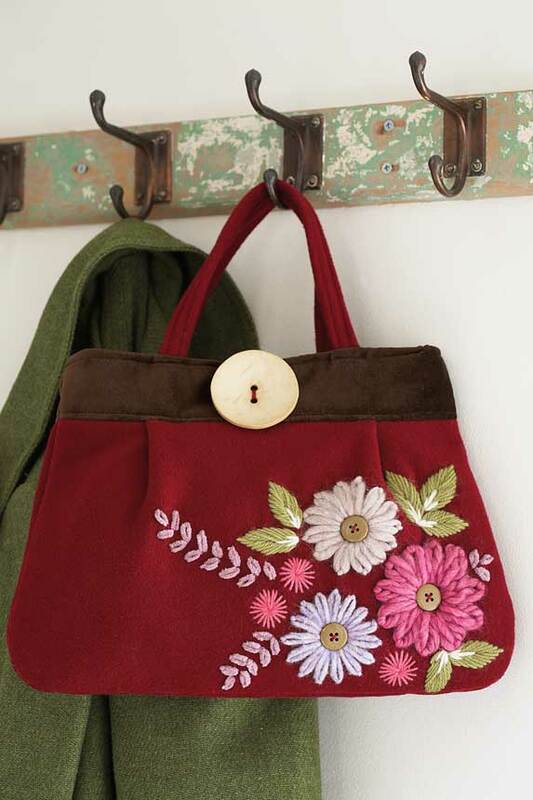 To finish, sew the over sized corn-coloured button to the top centre of the bag front, using red sewing thread. Make sure you comment your opinions below.